“I’m dreaming of a white Christmas” they sing and if you want some serious exciting free spins before Christmas we highly recommend Rizk Casino. Right now the countdown is on at Rizk and this means that you can join the big promotion until the Christmas holiday. During Rizkmas the casino will give all their players none the less but 1500 free spins together with other surprises on the way. So if you don’t want to miss out on any of the thrilling bonus spins during December you should head over to Rizk Casino at once! Just click any of our bonus links and you will be on your way. If you’re not a member yet you can always sign up at any time you feel like it and you will also be able to claim a nice welcome bonus at the same time. 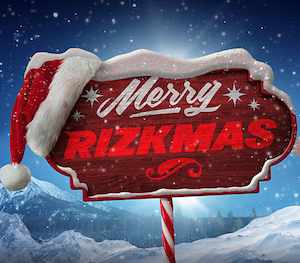 The Christmas campaign at Rizk is quite simple actually and as usual the free spins are free from wagering requirements. This means that you can claim bonus spins, enjoy them, win and make a withdrawal whenever you want to. It doesn’t get much better than that, we can assure you! And if you want to grab the free spins at Rizk all you have to do is play your favorite casino games until the 25th of December when the promo ends. Every time you log in and play casino games you will fill up your personal power bar at Rizk. Whenever it’s full you will level up and this also means that you will qualify for the free rounds. When you level up you will be rewarded with 10 free spins a day for five days in a row. You can claim up to 1500 spins during this promo and they are available on Aloha! Cluster Pays, Spinions, Starburst, Gold Lab and Warlords: Crystals of Power. In order to make the campaign and countdown even more exciting at Rizk this winter Captain Rizk and his casino dog Lucky has a little extra in store for you. Every Thursday during the promo he will give away extra surprises and if you don’t want to miss out on them you should visit Rizk every Thursday until Christmas Eve. If you’re not a member yet you can sign up at Rizk now and grab your welcome bonus. Spin the Wheel of Rizk and win everything from 10 free spins free from wagering requirements to £25 cash. Later on when you make your first deposit the casino will match your with 200% extra up to £100 as well.